I'm in Uganda at the moment. Dad came up here to spend Christmas with the grandkids. Mum couldn't make it because they have a limited travel budget and she's planning to travel to the States next year. Anyway, Grandpa Bob (as he is known around here) was remarking to me that the grandkids made out a great deal better than we did in Zambia. I turns out I was already aware of this. Because I remember what it was like growing up in Zambia. Because I was there. We had almost no toys at all. My favorite toy was a prize from sports day. I always came dead last on the real races but I did OK on the novelty races like the Egg Race. For the Egg Race, you have a spoon in each hand and you balance a hard boiled egg in each spoon. First you race 100 meters without dropping the eggs, then you eat the eggs, and finally you work up enough saliva to the point where you can whistle. The third place finisher gets a Knot Twitch String. Basically imagine if you took a jump rope and chopped it in half and then tied a wooden bead to the frayed end. The game was that you held the handle so the bead was hanging motionless, then you gave it a very specific kind of twitch and the bead would jump up and loop around and form a knot in the string on the way down. I got to the point where I could make seventeen knots in a row. After that the rope was too short and knotted, so the bead didn't jump properly and you had to stop to untie it. Jason's kids are too young for a Knot Twitch String but maybe that can be their Christmas present in a couple years. 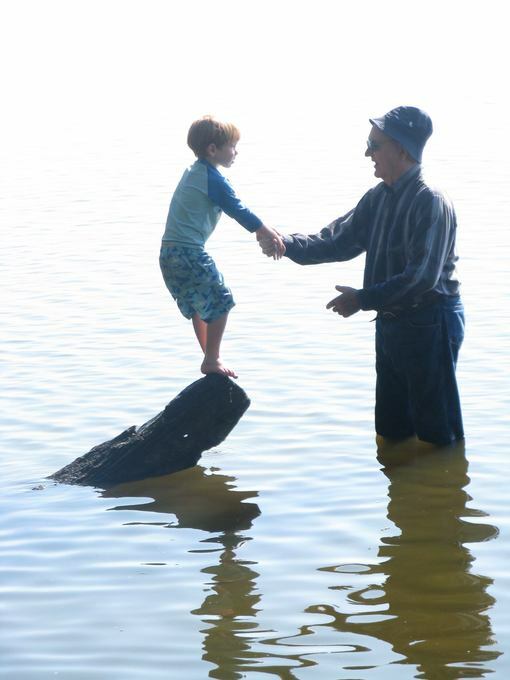 The picture is of Grandpa Bob and a grandchild at Lake Nabugabo. We went camping. I hope you enjoyed the holidays as much as I did.